My husband and I met at the College of Wooster, in Wooster, Wayne County, OH. A wonderful college!! Beautiful picture! Thanks for sharing it. What a beautiful picture, maybe one day I’ll get there myself. Hey, it looks like your artistic side came out on this one. Good shot! That’s a beautiful picture. I live in Wayne County, New York. Wayne County has both Amish and Hobits? Is that a mailbox he’s getting into? Low flying bird house? Photoshop it out and wow, you’ve got great! Great picture, as usual, Erik. Hope you are having a wonderful time. Be safe. Beautiful photo Erik! You have an artist’s eye for image. I put this one on my computer desktop. Your posts go so well with my morning tea. Gorgeous shot! (New book cover? Hint, hint?! :-)) I like the figure, myself! Great photo. My favorite Amish areas are Holmes and Wayne counties in Ohio. 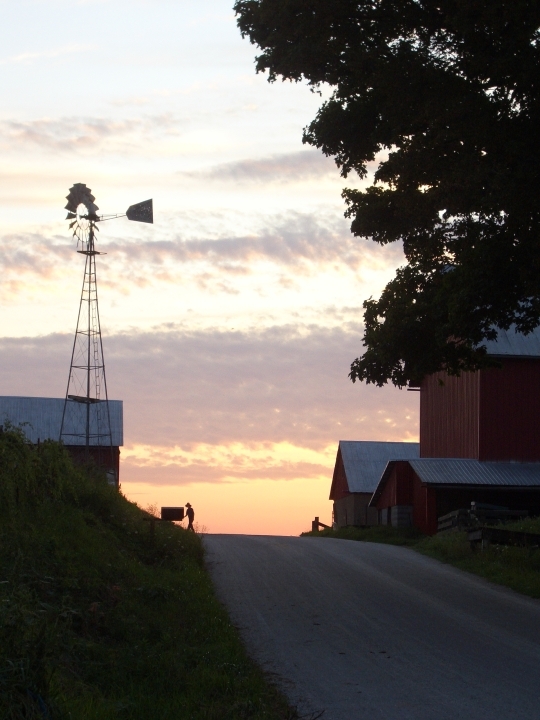 I visit Wayne and Holmes Counties once a year and love the photo. Perhaps I have even been past that house. I love seeing, reading about and learning more about the Amish. May they continue to enjoy the freedoms they do now. I would love to be there in that picture. One of the things I love about visiting Amish Country is the dead silence you can experience sometimes. That special kind of quiet that comes from no cars, no refrigerators humming, no leaf blowers! To me this photo captures that quiet. Thanks Erik. Betsy, I would LOVE to experience that kind of quiet, at least now and then. There sure isn’t much “silence” at the library where I work! (And we’re not allowed to “shush”, anymore.) It “sounds” like heaven! HOPE YOU’RE HAVING A GREAT VACATIO, AND GETTING US LOTS OF GOOD RECIPES OF THINGS YOU’VE EATEN…..YOU COULD ALSO ADD SOME RECIPES TO YOUR NEW BOOK I SUGGESTED :)…..
Glad you liked this shot. In answer to some of the questions, I’m not exactly sure how far I was from Wooster, my Wayne County internal compass is a lot weaker than my Holmes County one. I’m a bicyclist in Wayne County and probably have cycle pass that Amish farm many times. I’ve been riding in the county + Holmes county for many years now. Cycling is a great way to see the slower pace of the Amish community. Speedy that seems like great riding country. Probably harder once you get into the gravel roads more common in Holmes. I am not a biker, but did ride a bit in Wayne County, once. Also the Holmes County trail. May I Use a Photo? I am a graduate student at Cleveland State University working on a project for the state of Ohio. It is a best practices in planning resource for Ohio Municipalities. The website is http://balancedgrowth.ohio.gov/ . I would like permission to use your photo of Amish in Wooster county. If you agree to allow me to use your photo, how would you like me to cite you? Thanks in advance!